The Americans With Disabilities Act guarantees those with physical or mental disabilities equal access to employment, buildings, communications, programs and services. On July 26, 1990, the Americans With Disabilities Act (ADA) was signed into law by President George H.W. Bush. Employment. Prohibits employers with over 15 employees from discriminating against qualified candidates. State and local government services. Prohibits discrimination by state and local governments when providing programs and services. Public accommodations. Directs places of public accommodation to make “reasonable modifications” for accessibility and remove barriers to entry. Telecommunications. Requires telephone and Internet companies to provide a nationwide relay service for individuals with hearing and speech disabilities along with closed captioning of federally funded public service announcement. Transportation. Public transit offered by state and local governments, such as bus and rail service, must be easily accessible. Private companies, such as taxis, shuttles, etc., are also included. 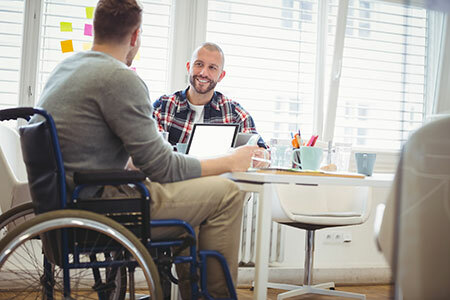 In addition, the ADA established the “reasonable accommodation” standard, ensuring that employers covered by the law provide the necessary and appropriate modifications for people with a disability to perform the essential functions of their job, without placing an undue burden on the employer. What Does ADA Consider a Disability? ADA covers both physical and mental medical conditions, and does not need to be severe or permanent to be covered. In many ways, ADA overlaps with the Individuals with Disabilities Education Act (IDEA) in that they provide protections for people with a disability and prohibit discrimination based on those disabilities. But where ADA is more broadly focused on anti-discrimination and accessibility, IDEA is narrowly focused on educational opportunities and protections in a school setting. Your child is covered by whichever law offers the greatest protection.